Our Fort Worth Scottish Rite Valley stated meeting on April 21, 2016 was a great opportunity for accomplishing necessary business, remembering our departed brothers, deepening our fellowship and was a special opportunity for learning and gaining light in Masonry. Often we have an opportunity to learn more about Scottish Rite Masonry and gain more light at our stated meetings. On occasion we have a very special opportunity to reach deep into the mysteries of the degrees enabling us to begin to understand or recall special tenants of a degree or of several degrees having “connective tissue”. There are many “special and esoteric ” degree studies that that illuminates our senses and reminds us that we should be ever learning, constantly seeking and increasing our knowledge of our heritage as Scottish Rite Masons. During our stated Valley meeting we enjoyed a special presentation that spread light across our members in attendance. Brother Chuck Dunning, 32 Degree KCCH, presented an introductory view of the Kabbalah that was outstanding. To state his presentation was an introduction is an understatement. He presented the Kabbalah in a historical perspective inclusively from three points of reference and drew direct connections to several of our Scottish Rite Ritual Degrees. Those in attendance received a portion of the light of the Kabbalah in a manner and a purpose that caused all to want to hear and learn more. Brother Chuck Dunning is a member of our Fort Worth Valley Class Director Team. Brother Chuck brings the same significant Scottish Rite Masonry knowledge, leadership and professionalism to the Class Director Team as was witnessed during the Kabbalah presentation. We are fortunate to have Chuck as a member of our Valley. He is also a member of the Scottish Rite Valley of Guthrie, Oklahoma. 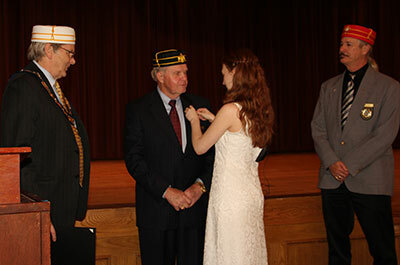 He has been involved with the College of the Consistory and with the Scottish Rite Ritual Degree Teams for over 25 years as they conferred the Degrees. Brother Chuck is a Department Head at Texas Christian University (TCU) directing, leading and counseling Senior Students completing their TCU education. Following our stated meeting, we enjoyed dinner and a very special program that was presented by our Rainbow Girls from the Burleson Assembly #374 International Order of Rainbow for Girls. The Young Ladies were lead by Lauren Zelenske. The “Ribbon Talk” presentation included an explanation of the various colored ribbons that surround the Holy Bible and their special relationship to the religious and moral values that promulgate the learning of these very special Young Ladies as they grow in conscious and stature as future leaders. Following the program by our Rainbow Girls, Brother Ken Curry, 33 Degree, SSIG Personal Representative and Chairman, of the Fort Worth Valley, presented a Certificate and Pin to Brother Bill Crow, 32 Degree, for completion of one portion of the Master Craftsman Program. We concluded our dinner and evening program with a round of fellowship and brotherhood greetings. Brother James Mendenhall, 32º KCCH, provided the Benediction and the meeting was closed by Brother Amarnath S. Murthy, 32º.